Andaman Discoveries staff in Singapore for Wild Asia Award! Andaman Discoveries staff was able to attend the Trade Show for the Asian Travel Market in Singapore. The purpose of attending was to accept the 2014 Wild Asia Award for being a finalist in the Cultural Preservation Category. Wild Asia hosted a responsible tourism booth at the fair, allowing an open space for responsible tour operators and organizations to gather and share ideas and experiences. They also offered presentations to highlight different areas of importance within responsible tourism. It was beneficial to meet the other winners and finalists from the Award categories and learn about their projects. It is always meaningful when like minded organizations can collaborate to share their thoughts and opinions on responsible tourism. It was inspirational to be in the presence of other amazing organizations that are actively engaging communities, empowering local people and conserving the environment! 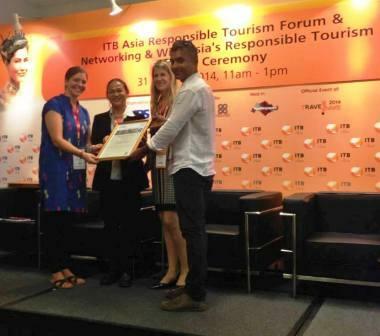 We would like to thank Wild Asia for the chance to attend the conference and their goals towards improving the platform for responsible tourism operators. We look forward to Wild Asia’s Awards next year and wish all Responsible Tour Operators the best of luck in the upcoming season!